Discussion in 'Online Games - News and Reviews' started by deemac80, Feb 19, 2014. Boing Boing Boing... It's another great hit from NetEnt. A 15 payline slot that is sure to bring some joy to your heart. Get ready for Spring with this hit straight from the garden. 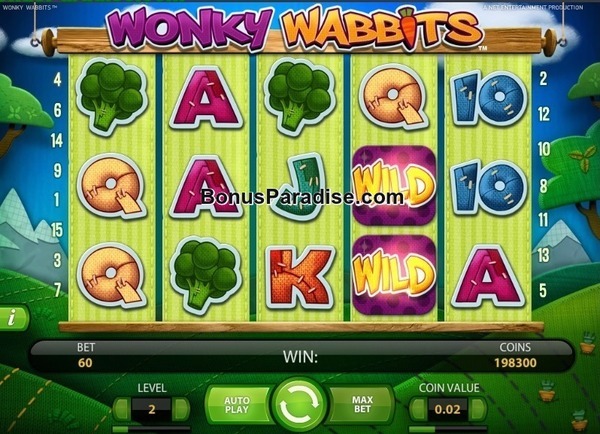 Wonky Wabbits is a brand new slot that brings crazy fun. Be prepared to add this to your favourites list. This 15 pay-line slot is sure to impress you with the Win Both Ways feature. You can win left to right or right to left ensuring even better chances to win. What an incredible way to rack up them dollars. Wabbit emerges and gobbles up symbols to create your big wins. There can be up to 14 WILDs on the screen at one time. Woooo-Hoooo! Carrots are the highest paying symbol and why shouldn't it be the wabbit's favourite snack! Not to forget all the other symbols from the garden : Tomato, Corn, Broccoli and Eggplant. Vegetables are great but who knew winning could be so good for you ? but you will have to wait until February 24th 2014 before it officially released and available at most other Net Entertainment casinos. Kotsy, VaennyTi, Ellis and 2 others like this. Great review deemac80. This slot looks so cool to play. Love the Wonky Wabbit. Well done Deemac on this review. Like every new game i am looking foward to play this one. What a fun looking game! Thank you so much for your nice review Deemac!